The lazy days of summer are upon us. Time for dipping our toes into the pool, backyard grilling, and cooling off with sweet desserts like homemade ice cream or strawberry shortcakes, or both! There is something about strawberry shortcakes that takes me back to childhood. We had a strawberry field about two miles from our house and would stop by the small roadside stand and pick up a few baskets full of warm, sun-ripened strawberries. With my pudgy little hands, I helped wash and hull the strawberries, sampling a plump berry or two. Last weekend, as temperatures began to spike, we brought out our ice cream maker to prepare for the summer. With all the fresh berries available at our local farmer’s market, we couldn’t resist whipping up a dessert that reminds us both of the first days of summer: strawberry shortcakes. After making a batch, we were reminded of how quick and satisfying this dessert is to make: macerated strawberries, buttery shortcake biscuits, and soft, creamy frozen custard made with La Lechera Sweetened Condensed Milk. The fresh strawberries are sliced, mixed with sugar then allowed to sit about 30 minutes until they have released their juices, making a syrup in the process. The biscuits are traditional shortcakes that are quick and easy to make, but in a pinch you can buy pound cake or angel food cake, or my favorite substitution, the cake-like Quesadilla Salvadoreña. The star of this dessert is the frozen custard. Shortcakes are typically stuffed with whipped cream, but we knew ice cream would be the way to go, more specifically ice cream custard or frozen custard. Two key components differentiate a frozen custard from ice cream: egg yolks and time. The egg yolks help emulsify the base, imparting a smooth, velvety texture. And unlike ice cream, frozen custard can be served a little on the soft side (think fro-yo), so you can freeze the custard shortly before serving. So not over-freezing your custard is key to maintaining its creamy goodness. Well, that, and Sweetened Condensed Milk. As you weigh your options for summertime desserts and fun in the sun, don’t be daunted by this recipe. It has essentially four moving parts: custard base, frozen custard, strawberries, and shortcakes. You can prepare the custard base up to 2 days before you need it. As you churn the custard in your ice cream maker, begin macerating the strawberries (which takes minutes to assemble) and let them do their thing. You’ll still have plenty of time to make these quick-bread shortcake biscuits. By the time your shortcakes are cool, your strawberries will be ready, and your frozen custard should be perfectly chilled, but still creamy. 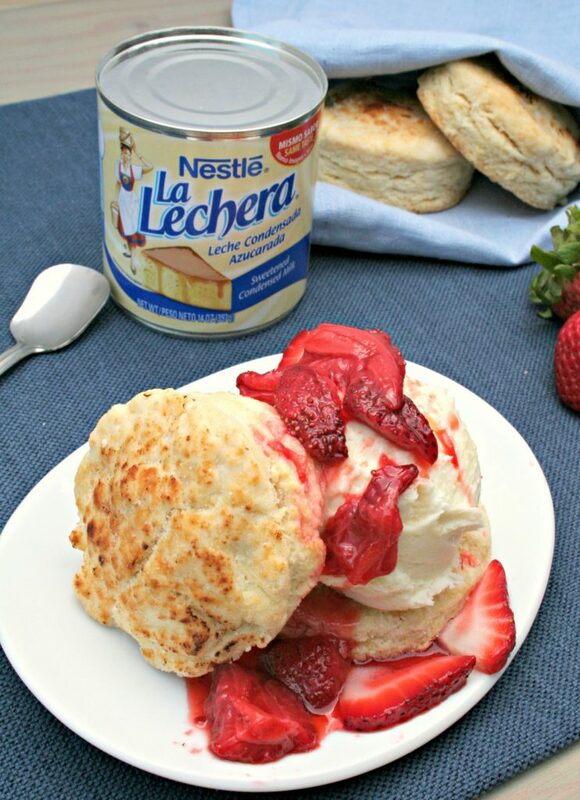 As you are cooling off this summer and want to offer your family a delicious sweet treat, bring out your ice cream maker and a can of La Lechera Sweetened Condensed Milk and make everyone happy. Place cream, milk and La Lechera Sweetened Condensed Milk into a medium saucepot. Slice vanilla bean lengthwise, scrape out seeds and add both bean pod and seeds to the saucepot. Heat over medium-low, whisking constantly, until it comes to a simmer. Remove from heat. In a separate smaller mixing bowl, whisk egg yolks and salt. Temper yolks by slowly drizzling in approximately ½ cup of the hot milk into the yolks while whisking constantly to prevent scrambled eggs. Then whisk in the tempered yolks into the remaining hot milk. Heat over medium-low, whisking constantly, until the custard thickens. Test for doneness by swiping your finger across the back of a spoon. When it leaves a clean line it is done. Place the custard into a bowl and cover with a piece of plastic wrap, making sure the plastic is touching the surface of the custard to prevent a skin from forming. Allow to chill for 2 hours or overnight. To make frozen custard, follow the ice cream maker manufacturer’s directions and churn until your frozen custard reaches the desired consistency, about 20-25 minutes. Place in a freezer safe container and freeze for at least 1 hour for a soft custardy consistency, or longer for a more solid ice cream. Toss ingredients together in a mixing bowl and allow sit at room temperature for about 30 minutes. Refrigerate until needed. Add flour, baking powder and salt in the mixing bowl of a food processor and pulse a 3 times to combine. Add cold butter and pulse until the mixture resembles coarse crumbs. Add sugar, egg and vanilla and pulse until just combined, being careful not to over mix. Dump mixture onto a lightly floured surface and quickly shape (round or rectangle) about 1 inch thick. Cut with a 3-inch cookie/biscuit cutter by pushing the cutter straight down without twisting the cutter. Place shortcakes onto a baking sheet and bake for 12-15 minutes until the tops are golden brown. Allow to cool for 5 minutes on the baking sheet before removing to a cooling rack to cool further. Split the shortcake in half. Sandwich a generous scoop of La Lechera Sweetened Condensed Milk Frozen Custard between the shortcake halves. Spoon strawberries over the top and enjoy. Optional: serve with a dollop of whipped cream.